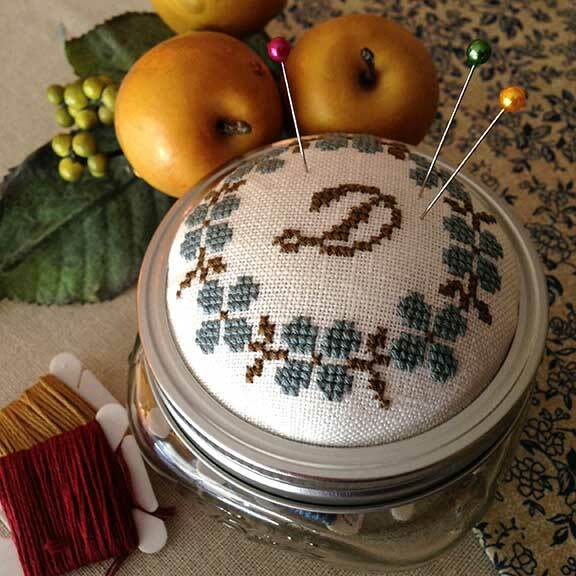 For this personalized pincushion project I used a small 8-ounce mason jar because that’s what I had on hand, and because I thought it would be the perfect size for storing little things, like a few skeins of floss for a small project. 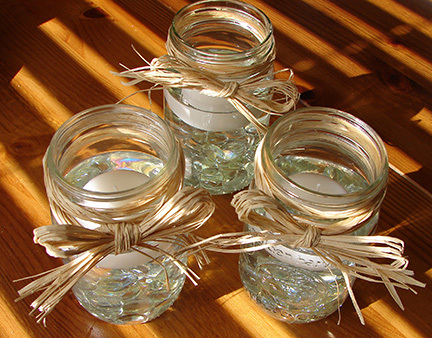 Of course, I could have reused any size mason jar from my cupboard stash, as long as the jar came with a ring and lid separate. I started with the Stacy Nash Primitives “Monogrammed Pinkeep” chart which I reworked slightly to fit my widemouth jar’s 3” opening, and I ended up adapting it to a 45×45 stitch design that measured 2-7/8×2-7/8” overall flat. 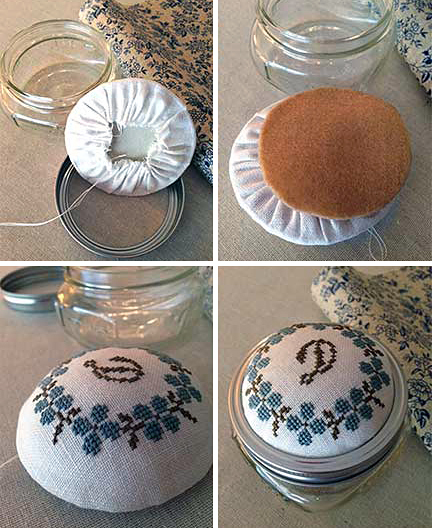 I wanted a puffy-looking pincushion, and so figured that this size would fit perfectly inside of the jar ring and once the stuffing was added would pop up just enough to create a nice clean border all the way around. This I stitched on a remnant of 32-count oyster linen using two strands of DMC floss (926 & 610) over two threads. I chose a lighter weight linen because I knew I would need to screw the lid back onto the jar in the end, and a thicker fabric insert would make that next-to-impossible. Once the actual stitching was completed, I trimmed my linen to the size of a 6” circle. Using a regular sharp needle and doubled thread, I basted all the way around and about a half-inch inside the edge, and pulled the thread to gather the linen slightly. I had to double the thread to make it strong enough to gather the material without breaking. I don’t think this would work with Aida cloth, as that is too thick and stiff, but the linen I used was just fine. I stuffed the circle with enough polyfill to make a nice semi-firm cup shape. I like my crafts projects to look perfect, or at least as perfect as I am capable of, and it actually took quite a bit of trial and error to get just the right amount and make absolutely sure that there were no lumps in the stuffing! When I was satisfied with the look and feel, I set the jar lid top in place atop the stuffing and gathered the material tightly and evenly around it, tying off the threads. Making sure that my cross stitch design was perfectly centered, I ran hot glue under the gathered fabric edge to tack it down to the lid. Using the inside of the jar ring as a template, I cut a 3” circle of felt which I hot glued into place to cover the gathered ends, and then just screwed my pretty new lid onto the jar! I had everything on hand, so this project cost me nothing, which was a sweet little bonus.